Dever-Boaz, a three-sport standout from Woodlake High School and Cal-Hi Sports Small School Athlete of the Year; was Margie Wright's first softball recruit at Fresno State. Choosing the Bulldogs over UCLA, Dever-Boaz would post an 84-12 pitching record, toss 58 shutouts and post six no-hitters. During those four seasons, the Bulldogs reached the NCAA Women's College World Series every year, finishing second three times and fifth once. _Dever-Boaz was honored three times as a second-team All-American (1988, '89, '90). She was a two-time Academic All-American and the university's female Big West Scholar Athlete of the Year in 1990. In addition, the pitcher/third baseman was named All-College World Series twice, made the all-regional team three times, and was a first-team all-conference choice four times. _Winning and Dever-Boaz went hand-in-hand, as she was a vital cog in championship teams in softball, volleyball and basketball at Woodlake. In 1985, the Tigers won the state Division III basketball championship with Dever-Boaz contributing as a high-scoring guard. _During her prep softball career, she hit .614, stole 86 bases, and struck out just twice. In the circle, she was 35-4, with 15 no-hitters and 2 perfect games. In volleyball, she was the first female Woodlake athlete to have her number retired as she helped the Tigers to a 92-4 record and four league titles. _Dever-Boaz because the pitching coach and recruiting coordinator at South Carolina. Then it was on to Arkansas, where as a head coach she led the Razorbacks to two NCAA Tournaments and six Southeastern Conference tournaments. She was the SEC Coach of the Year in 1999. _She was also an assistant coach at Florida and Virginia, and manager of the Washington Glory, which won the National Pro Fastpitch championship in 2007. 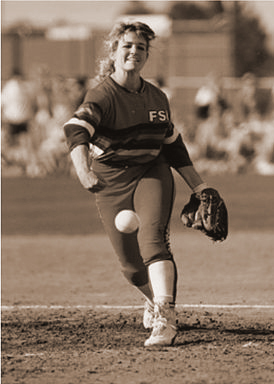 Dever-Boaz wrote "The Art of Pitching" and produces softball training videos. She is an international instructor in Holland, Canada, Italy and Australia.